1. 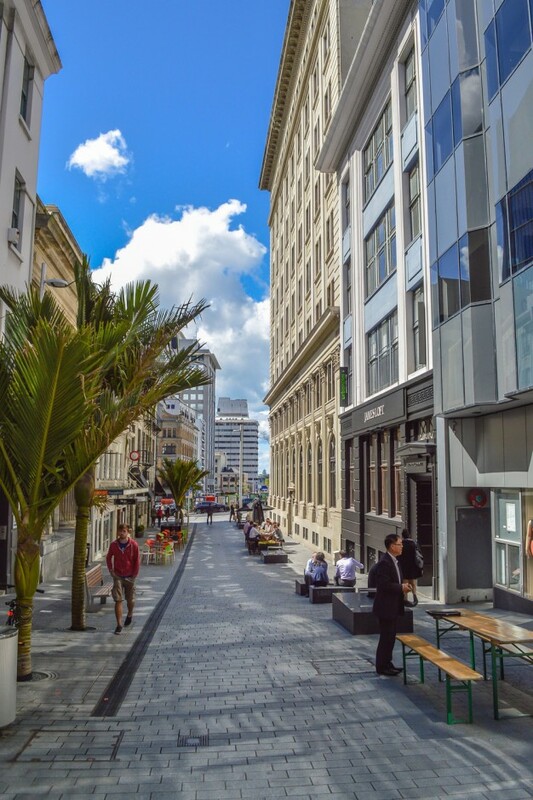 WIDE SIDEWALK SPACES – The very first thing we noticed when stepping out of our Airbnb apartment and onto Auckland’s major thoroughfare – Queen Street – was the incredibly generous width of the walking space provided. But it wasn’t just Queen Street. 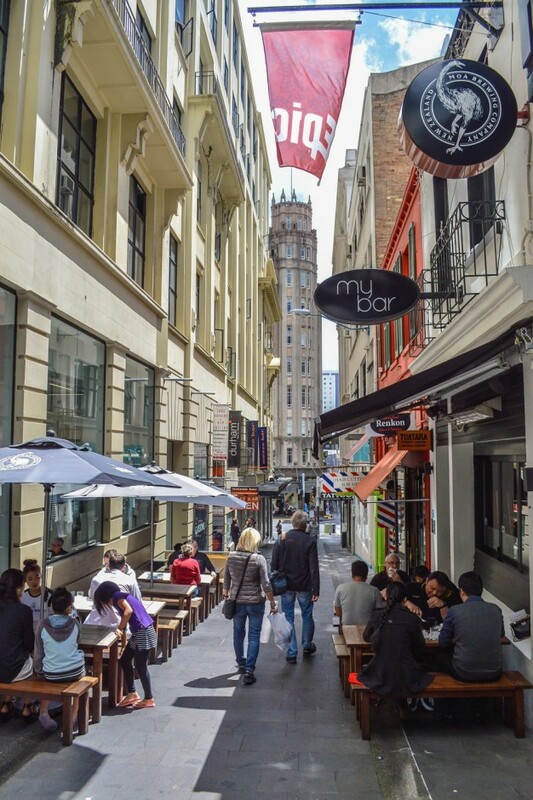 Every single shopping district we visited, including Karangahape and Ponsonby Roads, featured ample room for walking two, three, or even four abreast in both directions, with space left over for a small sidewalk patio. 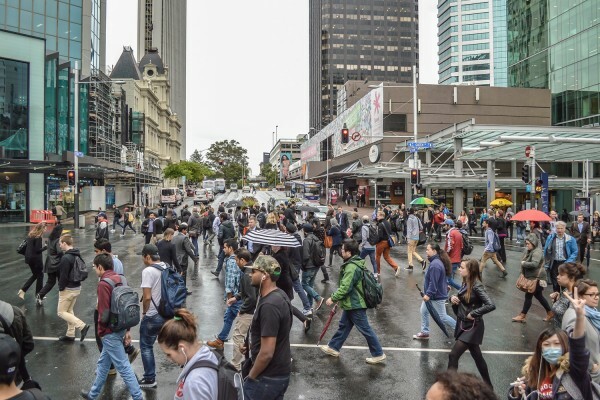 It was for good reason, we later learned that Queen Street moves upwards of 60,000 people on foot per day (versus 20,000 cars) – demonstrating walking is clearly the most prevalent transport mode in the city centre. 2. 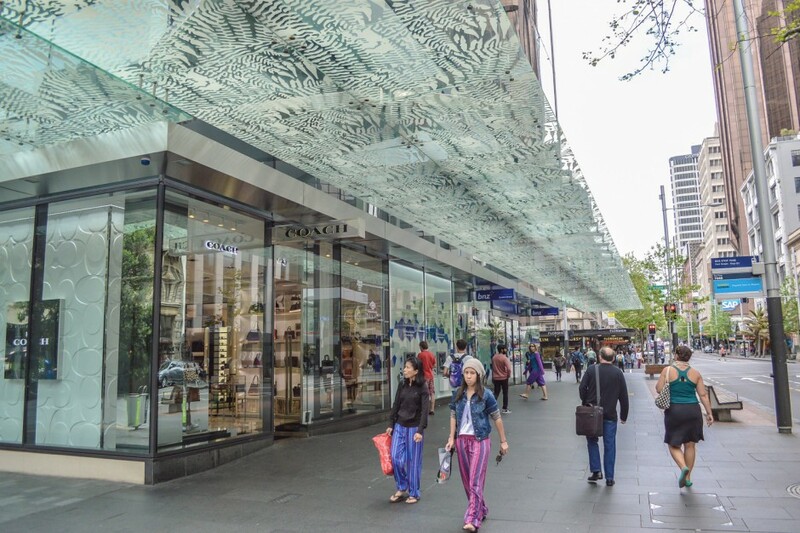 GENEROUS, CONTINUOUS AWNINGS – A second feature we noticed promenading around Auckland’s bustling streets was the presence of a generous, continuous awning overhead. Coming from a place that sees its fair share of rain, to a part of the world with famously fast-moving weather patterns, it was something we definitely appreciated, and made the most of during our stay. The luxury of walking to your destination without an umbrella is an important one, allowing more efficient use of space (without the distinct clutter of open parasols). 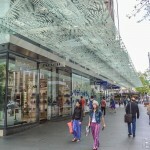 These awnings are mandated in all retail areas by a zoning bylaw, part of their council’s multi-pronged strategy to create a more human-scale city. 3. 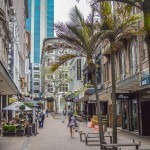 LIVEABLE LANEWAYS – As we continued to explore Auckland by foot, we were struck by the amazing way they have managed to encourage life between buildings by activating their alleyways. 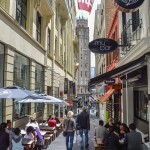 No doubt inspired by the success of a similar scheme in Melbourne, city officials have cleaned up a number of laneways in the city centre, and offered incentives for entrepreneurs to open up retail or food service businesses there. The end result is the remarkable reclamation of space that would otherwise be used for garbage storage or illicit activities. Instead, it attracts visitors morning, noon, and night for a morning coffee, a lunchtime meal, an afternoon shop, or even a late night drink. 4. 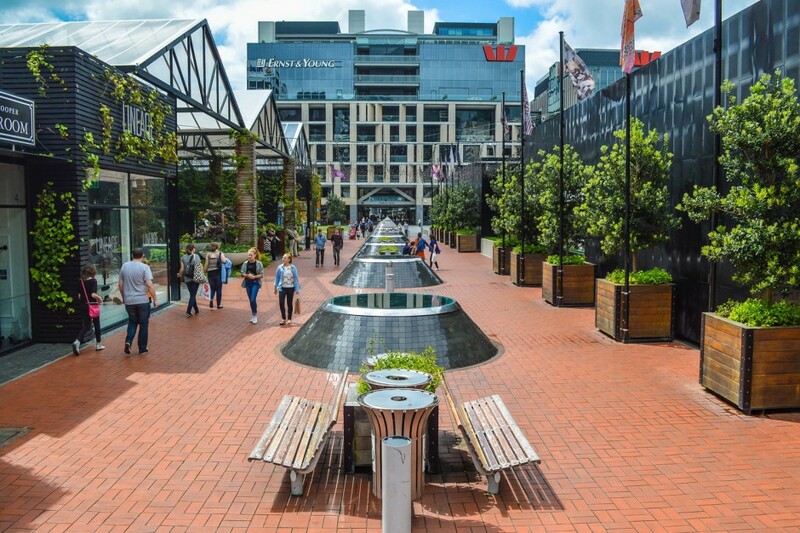 EFFECTIVE SHARED SPACES – Perhaps the single city-building issue around which Auckland is garnering a positive reputation is their innovative “shared spaces” program. 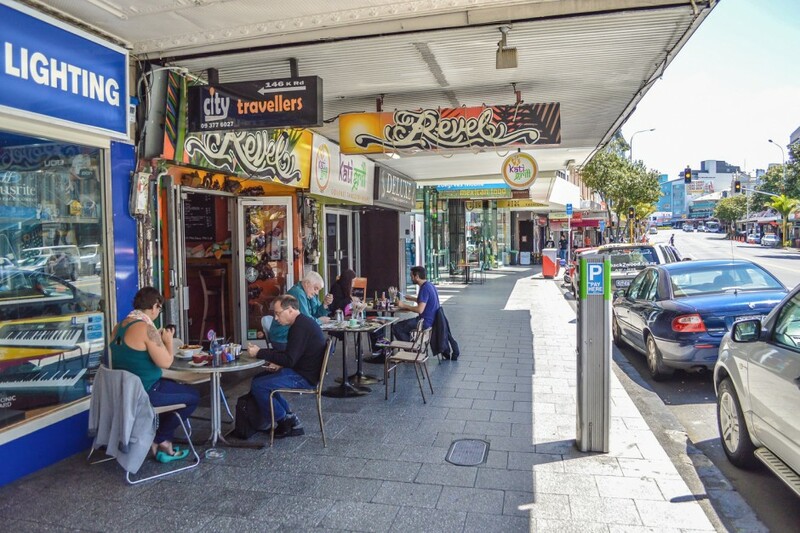 In the past few years, they have transformed nine different streets by removing the traditional distinction between footpath and road, and reducing the amount of on-street parking. 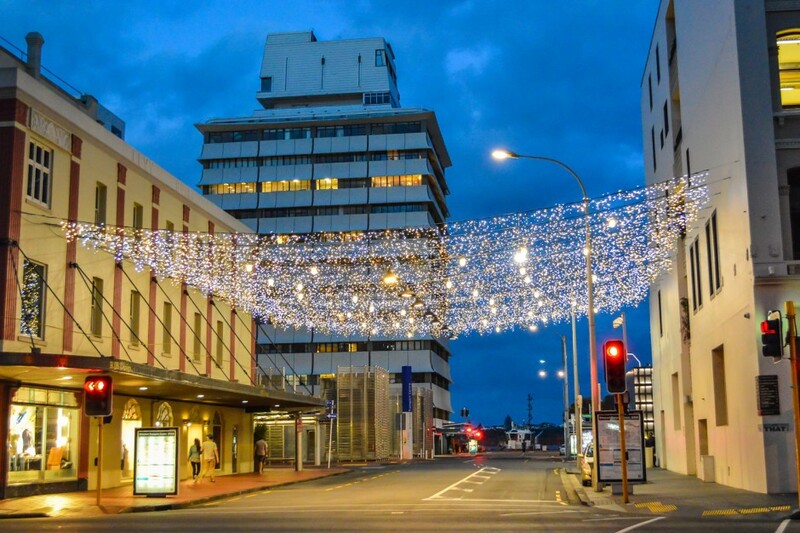 Data collected from these projects has shown a 140% increase in foot traffic, a significant decrease in vehicle speeds, and a big bump in retail sales (with an amazing 439% increase in hospitality spending along Fort Street being the stand out). We were pleasantly surprised at how comfortable we (and many others) felt using these spaces; proof that if you treat cars as trespassers, they will act accordingly. 5. PEDESTRIAN-ONLY STREETS – Well-designed and executed pedestrian malls remain a bewildering rarity in North American cities, and in our hometown of Vancouver they are frustratingly non-existent. We were surprised to find many New Zealand cities follow the lead of their European counterparts in this realm. 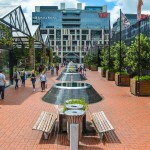 While Auckland clearly prefers the shared space model, this hasn’t stopped them from pedestrianizing a number of streets, including Te Ara Tāhuhu (Maori for ‘ridgepole’, the backbone of the traditional meeting house) – the central pedestrian street that connects Britomart Transport Centre to Britomart Place, which is lined with shops, restaurants, offices, and a large public square, along with Vulcan Lane – which has been pedestrianized for almost fifty years. 6. USER-FRIENDLY CROSSWALKS – Crossing the street represents the single most uncomfortable and dangerous part of the pedestrian’s journey, but there are many little things a city can do in order to minimize that inconvenience and risk. We saw many of those concepts in action on the streets of Auckland. Scramble crosswalks were standard at nearly every intersection, allowing direct travel in six different directions, along with generous countdowns (upwards of 30 seconds), and all vehicle turns banned on red lights, with that red light commonly being held for nearly the full signal cycle. In addition, scrambles on Queen Street run twice during every cycle, meaning shorter wait times, and faster point-to-point travel times. Last but not least, many mid-block crosswalks, (fully signalized, and as little as 50m apart) were raised several inches from the street, extending sidewalks across the road in an important and distinct manner. 7. 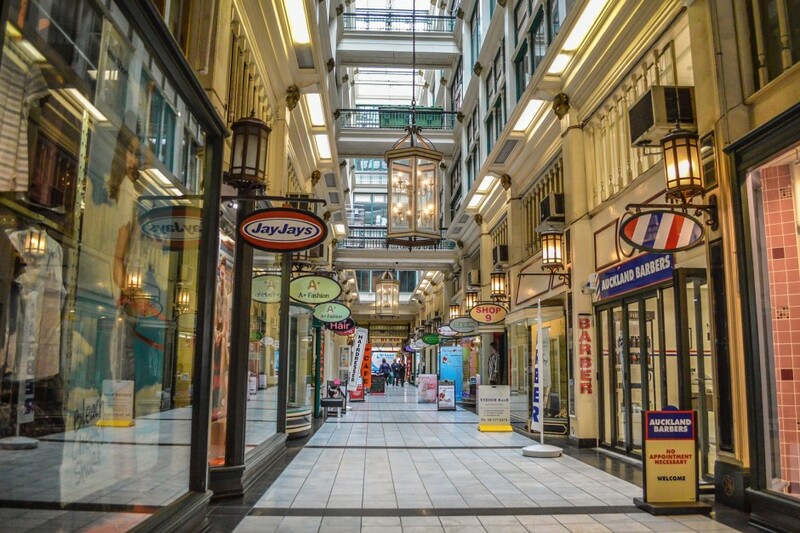 MULTI-PURPOSE ARCADES – Another very visible European influence seen in New Zealand is the prominence of the classic, multi-storey arcade. 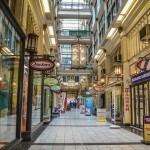 These perpendicular corridors serve to pull activity off the street, with both retail and office space, while also providing a mid-block shortcut for pedestrians looking to get to an adjacent street. 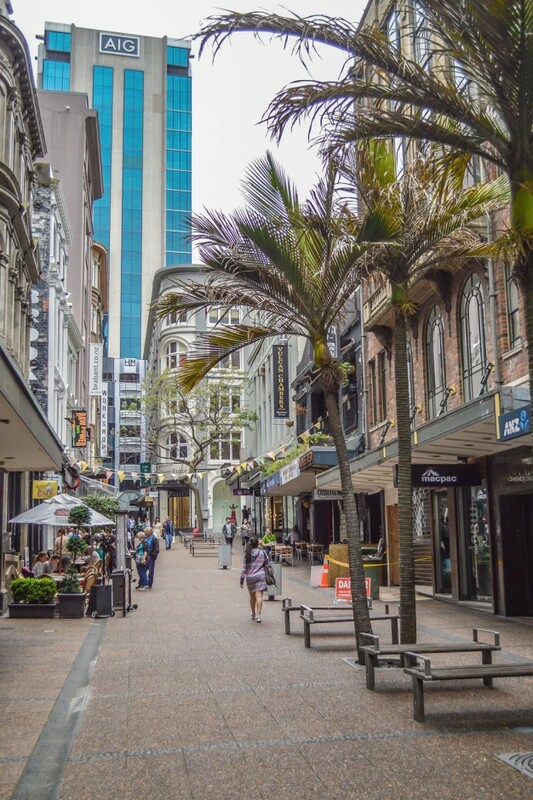 We spent ample time exploring Auckland’s arcades, discovering countless little “Mom and Pop” businesses that otherwise wouldn’t be able to afford the rent on a busy high street, such as book and record shops, barbershops, and the most amazing espresso bars. 8. 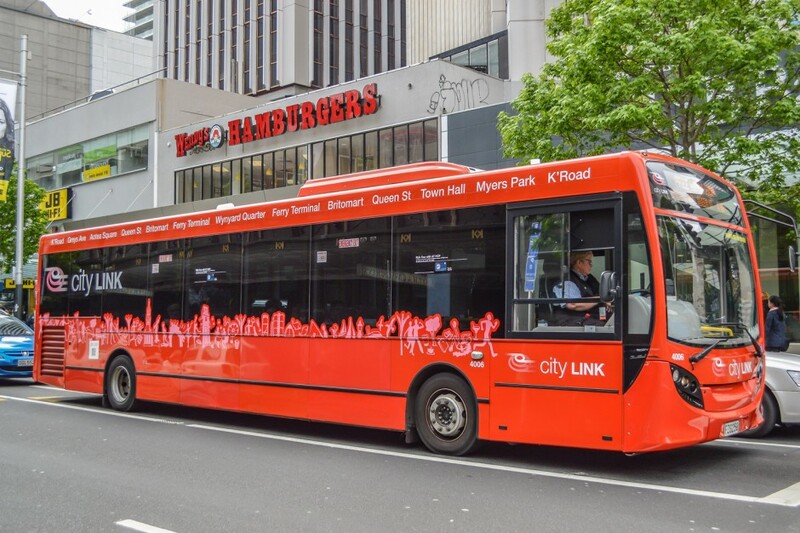 CITY LINK BUS ROUTES – Fast, frequent public transit can serve to complement other active modes of transport (walking and cycling). Auckland executes this perfectly, at least with the former. 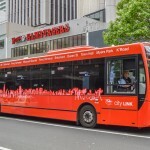 Running every 7-8 minutes between the city centre’s distinct shopping districts and the Wynyard Quarter, the “City Link” bus route extends the range a person can walk, provides respite from some of the unforgiving topography, as well as spontaneous shelter if an unpredictable weather pattern hits. And the price is right: just 50 cents cash per trip, or free for a HOP (reloadable fare) cardholder. We found ourselves hopping on and off throughout our stay, especially if we were running late. 9. 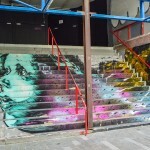 UBIQUITOUS STREET ART – While admittedly doing little to improve the physical act of walking, the application of street art can certainly improve the psychological side of it. 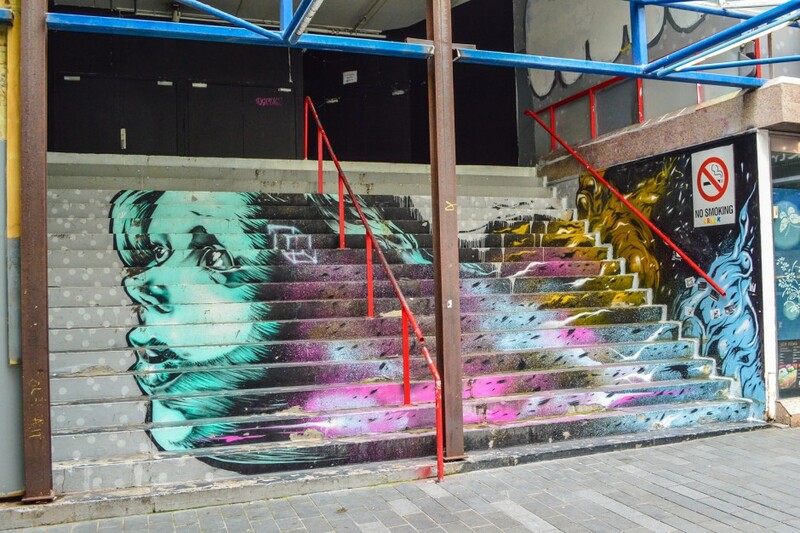 This is another area where our hometown of Vancouver could certainly learn a lesson, with a frustrating tendency to remove a piece of art within days of its appearance, regardless of its popularity or significance among citizens. With the right policies in place to encourage meaningful street art (while removing the meaningless pieces), cities can transform the blank canvases of concrete walls, silos, tunnels, stairs, and underpasses into something far more welcoming and enjoyable for everyone. 10. 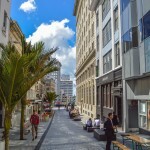 PLENTIFUL PUBLIC SPACE – While many of these items have focused on small urban spaces, it is imperative that cities provide public spaces of varying scales and sizes. 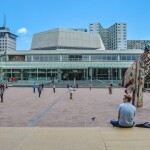 On the opposite end of the spectrum, Aotea Square acts as Auckland’s living room for twelve months of the year; a civic square suitable for crowds of over 20,000 people for open-air concerts, community gatherings, parades, fairs, markets, political rallies, and even an outdoor ice rink during the (relatively) mild New Zealand winter. 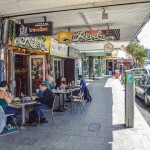 For pedestrians, it serves as both a destination and a thoroughfare, connecting the seat of local government with several theatres, shops, office buildings, cafés and restaurants. 11. INVENTIVE PLACEMAKING – In addition to public art, there are many other small, low-cost things a city can do in order to make their streets more people-friendly. 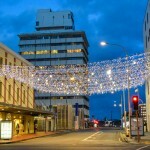 These overhead lights – for example – photographed in the Britomart precinct, are a great illustration (although they must do something about that desolate space below it). We saw many similar examples during our travels, from portable, outdoor reading rooms fabricated with shipping containers in the Wynyard Quarter, to a collection of bean bag chairs that were put out in the Te Ara Tāhuhu public square every morning (and then locked away at night). The skies – or at very least, our imaginations – really are the limit. 12. 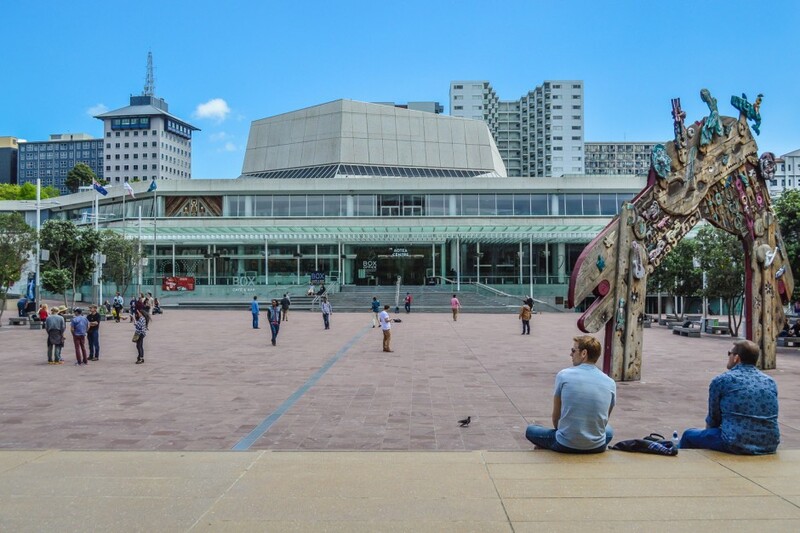 SEATING, SEATING, SEATING – One cannot understate the importance of providing public seating – and lots of it – in the fine art of building a life-sized city. Urban planners are finally moving past the idea of considering “loitering” a dirty word, and the notion that an abundance of benches only attracts undesirables. Many of the concepts above include one key ingredient: seating in different shapes, sizes, and configurations, which can be used for checking email, sipping a latte, catching up with friends, or simply soaking up the city around you. And on that front, Auckland has been remarkably successful in providing spaces where its citizens want to live, work, rest, shop, and play. Chris Bruntlett is the co-founder of Modacity, a multi-service consultancy focused on inspiring healthier, happier, simpler forms of urban mobility through words, photography and film. You can find Chris on Twitter: @modacitylife. Wow amazing to see Auckland praised for walking – it must be bad elsewhere if that is the case. Auckland is one of the most auto dependent cities in the world – it makes LA look like a beginner in catering for one mode only. Sure, walking has been prioritised in the centre of the city. But what about the rest of Auckland? Mentions of ‘shopping districts’, that I’m sure the majority of Aucklanders never visit. And it’s still cheaper to park in the city on weekends than it is to take public transport, at least if there are 2 or more of you (I’d like to see the cost of public transport go down, not parking go up). Loads of issues with pedestrians at intersections outside of the CBD – so many T intersections where you have to cross twice when you only should need to cross once, because there isn’t a crossing at the other side, though I suppose it is better than the horror stories one hears from the US. Ben’s comment above, and the analysis at Transport Blog, is a lot more comprehensive than my few complaints. you’ve got to be kididng me?? walking in auckland is an incredibly unpleasant experience. everywhere you go you’re surrounded by four lanes of traffic, gated parking garages, parking lots, etc. there’s no pleasant interface as a pedestrian. even on the waterfront you just get a big red fence. this city is beyond car-dependent. it’s pitiful. cars get the priority here even when you’re just trying to cross the street. how could authors from canada claim auckland gets walking right when in canada pedestrians are given the right of way, not cars. this in itself shows exactly what is prioritized in nz. Yep, Ben nails it. A lot of work to be done if pedestrians are to be truly the highest priority like the transport planning says. There should also be a couple of law changes around turning and giving way to pedestrians and cyclists. 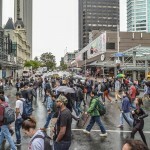 If anything sums up the attitude to walking it is the fact that Queen St retailllers campaigned against pedestrianising Queen St.
I’ve lived in both Vancouver and Auckland for years, and I think this article accurately shows how much better it is to be on your own two feet in Auckland’s CBD compared to Vancouver’s downtown core. Vancouver’s lack of downtown walkability is a shocker. Yes cars are a little more slow and polite in Vancouver, but the built environment is considerably worse for pedestrians. At the end of the day, I’d love to see a comparison with a truly walkable city like Copenhagen.